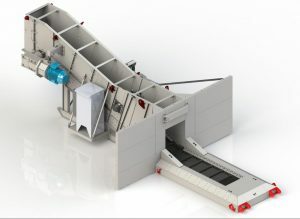 The FLSmidth Buffalo reclaim feeder has an on-board motor control centre. DENMARK – Adaptability is the watchword in FLSmidth’s Buffalo range of low capacity modular reclaim feeders, making it a versatile offering for anything from run-of-mine applications by medium-tier miners to flexible stand-in units for larger operations when stacker-reclaimers require maintenance downtime. The modular format allows different discharge heights and loading decks of various lengths to suit the required application. It also facilitates transportation of these units in standardised containers to remote locations, after being manufactured in a dedicated FLSmidth workshop. The feeder system is modular so it can be tailored to meet customers’ specific requirements and ensure optimal productivity, with easy reclaiming using dozers or front-end loaders. Depending on the application and the level of mobility required, the units can be mounted on skids or even wheels to be relocated from one position on site to another. This further enhances their versatility. The motor control centre (MCC) is located on board the reclaim feeder and only the power supply needs to be isolated before relocating the unit. Perfectly suited for soft, non-abrasive material such as coal, salt, potash or gypsum, Buffalo reclaim feeders and feeder breakers can be installed as a free-standing units – with or without civil works – or as a multi-unit systems with hoppers or sizers. The modularity of the units also makes for easier logistics. Rather than demanding the large lifting equipment for the conventional size of composite units, this range requires much lighter lifting capacity of just two to three tonnes. The economy of this design extends to manpower, as fewer workers are required for assembly and commissioning. The heavy-duty design features replaceable individual parts throughout the full length of the feeder, which is powered by electromechanical and hydraulic drives. Flow control is achieved through adjustable hydraulics, variable speed drives and gearbox ratios. Pitch chains are available in 10 cm. The hydraulic take-up system ensures ideal and consistent chain tensioning on the shaft take-up assembly. With auxiliary components such as wheel assemblies, lights, lubrications systems and safety features FLSmidth offers a true, fit-for-purpose solution. Find the closest dealer at www.FLSmidth.com.